In an era of smartphones with the option of myriad ringtones and notifications for every little thing, I have been paying more attention to Trek computer and device beeps. The old TOS communicator 'ringtone' with its two low-pitch beep tones, for instance, makes a great unobtrusive ringtone. This brings me rather quickly to one point I wanted to make, in that it's really annoying that the TNG era did not include a similar communicator ringtone. Instead, of course, everyone hears "so-and-so to Picard," "hey Captain," or somesuch, like a walkie-talkie. I can't imagine, especially in a military setting, having someone call me and in doing so letting everyone around know who it is. And as we saw in some episodes, such as "Sin of the Father", Picard gets a call while in the middle of something and then must excuse himself, but only after everyone knows who's calling. It's rather absurd. And what's worse, when on the ship, there's an attention tone when someone calls, consisting of three or four short low-pitch tones (possibly even derived from the TOS communicator noise, really). Why have that on the ship but not use it elsewhere? You're less likely to need such a thing on the ship. Of course, with the communicator sitting right on the chest a mere vibrate setting could've been used, but even that wouldn't have always been useful. But I digress . . . So, in the course of rewatching assorted episodes, I've kept an ear open for the noises. To be sure, I've always been a little more attuned to it . . . I recall watching Generations and noticing the door chime to Picard's quarters being very different and somewhat obnoxious compared to during the TNG run . . . but only when you really start to consciously listen for it do you realize different things. For one, going from an early TNG episode to a Voyager episode is truly jarring. It doesn't even feel like you're watching a ship from the same organization. 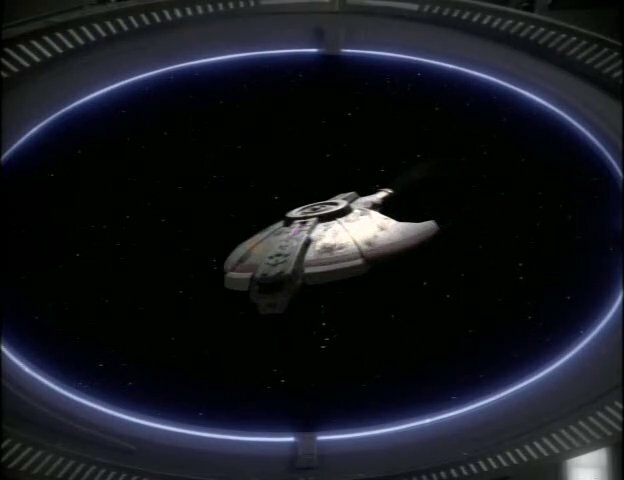 At least with the Defiant on DS9, they generally kept a level of audio consistency, so that much as you have the TNG transporter effect still in use, you also have the same computer beeps and doorchimes (save for occasional hiccups, like a really odd door tone for Sisko's quarters in one episode). And really, I think the DS9 example is how it should be. 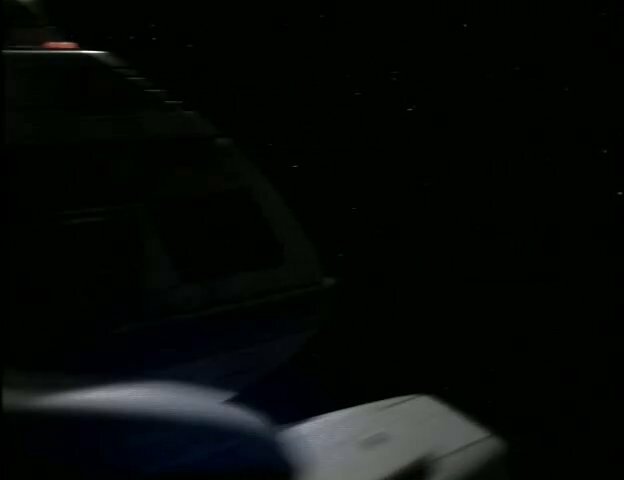 Audio feedback and signalling from the computer is as important as visual readouts, and it truly makes no sense to me that they would have such vastly different noises between two Starfleet ships as you see with Voyager versus the rest of the fleet. If you have ten different sounds for ten different things, then your training over the years ought to have included knowing just which noise means what, so that you don't even have to look to know what some beep-beep-beep means. The information just filters into your consciousness just as if the computer had just spoken the words to you. True, folks can retrain themselves with different noises, and you could even have multiple sound packages or themes available, but that's all just a little messy. In a military setting where folks might go from one ship to another in situtations where milliseconds count, that just annoys me greatly. A. "Hey, the impulse manifold alert tone on this duotronic computer system makes a toot-toot-toot sound, but on the new panels it's more a wheep-wheep noise." B. "You get used to it." Okay, I can roll with that. But eventually that duotronic thing is going to get replaced, and that's a single noise and people will know it. This, unfortunately, brings me to my other point, in that the actual sound effect continuity was not necessarily what it could've been. Sure, there were certain occasions where we can try to be forgiving, such as the terrible nasty comm button chirp thing in "Trials and Tribble-ations" when Kirk calls Dr. McCoy to the bridge. (Of course, there *was* a CD released with all sorts of TOS sound effects by that point, so why make up some new sound that was so jarringly different?) And there's "In a Mirror, Darkly", where T'Pol tries to contact another area from the conference room of a Constitution Class ship and the TNG in-ship comm tone (the three or four tones referenced earlier) is used. But the real problem was that even during early TNG, noises were getting repurposed somewhat haphazardly, as if nobody was keeping notes on what the sounds had been used for before. True, I can't say much, as I haven't been keeping exceptionally good notes myself just while listening, but then I don't get paid for this. And yes, for the most part, the sound effects are more of a subconscious thing for most, and it is probably enough to simply get the point across that the computer wants their attention or something. But of course, that same sort of thinking is not always true . . . red alert is red alert, the little bwopbwop of Worf's panel saying the weapons are firing was distinctive, and so on. That's also not the case visually, where vast fortunes have been spent to alter the visual representations for the Original Series, and a vast fortune is in progress to bring the effects of TNG up to modern standards. Wouldn't it have been nice to have the sound continuity be as good, too, so that when you heard a noise you knew what was going on as fast as the characters, even just by subconscious osmosis from excessive watching? 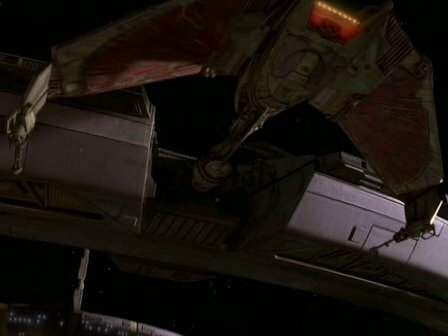 While defending my runabout argument elsewhere, and the concept of the assumption of parity in general, I noticed that the Cardassian shuttle from "Profit and Loss"[DSN2] I took to be runabout-sized probably is not.  While scaling against DS9 is always a headache thanks to 'dramaturgical' rescalings by David Stipes and the like (leading to widely varying size representations for everything including the station), the best shot of the docking would seem to indicate a vessel two to three times the size of the runabout when compared against later Bird of Prey dockings. 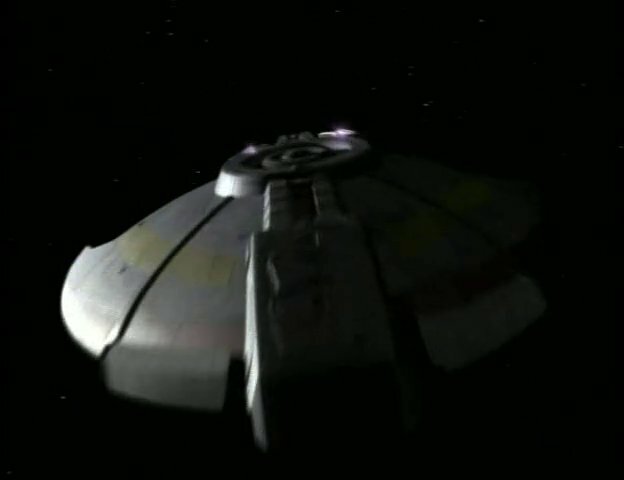 Further, the exact same model appears in "Tribunal"[DSN2] as the computer-identified Cardassian patrol ship, Hideki Class, and while the shot is composed in such a way as to make definitive scaling virtually impossible, the exterior view (as well as the internal image via monitor) is not inconsistent with the "Profit" vessel. Later fleet shots of a similar hull (usually with a more yellow ochre color and missing what some identify as cockpit windows on the front of the model, though we never saw them lit) are generally larger. Though there was the Cardassian shuttle from "Tacking Into the Wind"[DSN7] which was runabout size or smaller when compared to a Jem'Hadar attack fighter. Bernd at EAS suggests the model was modified for this appearance, however. Alternate title: "In Defense of the Danube"
This has generally been used as evidence that the Danube class runabouts have a maximum speed of warp five. Also, early runabout design concepts (wherein they were going to re-use an old TMP-era ship model that later got used as the Sydney Class USS Jenolan in "Relics"[TNG6]) had the runabout limited to warp 4.7. However, in my opinion, that quote only implies that Kira took Sisko's order about looking for "high warp capability" to mean "warp five or more". Nothing there specifically mentions runabout maximum warp velocity, nor was it ever mentioned throughout the series. In the context of the episode and the search, this makes sense . . . there's no reason to assume that visiting starships have some sort of advertisement of their actual maximum warp speed. Vessel registrations may include some sort of similar information and that might've been what Kira was looking at, or alternately they may have tried to scan all the ships and take a guess. But either way, the actual truth of the matter was undoubtedly hazy. Or, put it another way . . . if I wanted to find a ship among several that might be able to outrun the Enterprise-D, I'd search first for any that might be able to exceed warp nine . . . maybe seven or eight if I want to be sure to account for some lead time, trickery, et cetera. That doesn't mean the Enterprise-D is limited to warp eight (as we know), it just means I'm narrowing down the possibilities. 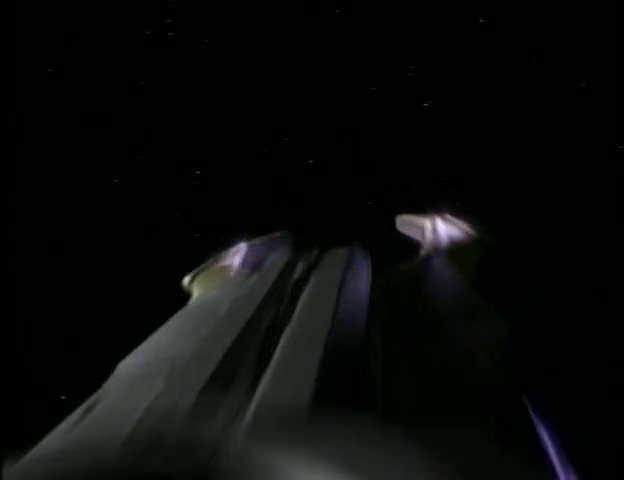 Besides, given that frickin' coffins can accelerate to and maintain warp nine (from "The Emissary"[TNG2]), and given the rather voluminous warp mechanics of the runabout by comparison, and given that runabouts are seen to be capable of evading and escaping from fast ships chasing them ("Vortex"[DNS1], "Apocalypse Rising"[DSN5], "Treachery, Faith, and the Great River"[DSN7], just to name a few) and given that the frickin' Suliban could clock warp five in their little pods 200 years prior, the whole notion of a warp five runabout just doesn't work in context. It would be like the US Navy putting out a PT boat that is propelled at oar-speed. But unfortunately, people latched on that because there was little else to go on. However, we can ponder another point. In "The Jem'Hadar"[DSN2], Jake Sisko orders the Rio Grande computer to set a course for DS9 at warp eight. The computer doesn't reject his command on the grounds of velocity correction, but simply notes that the autopilot is not functional. Of course, it might've reacted the same way if he'd ordered warp 13, but the interesting part to ponder is that Jake ordered it at all. You see, a plot point with this episode (and indeed, the early part of the series . . . see "Civil Defense") is that Jake had been assisting Chief O'Brien with assorted maintenance duties, and in this episode we are told that he'd been assisting with runabout maintenance. Warp eight is a very odd figure to choose if you are desperately asking for a fast speed and unclear on the vessel's maximum velocity. Why not nine, or 9.9 even? Put simply, Jake wouldn't exactly be my go-to guy for tech questions, but he's not completely ignorant, and I think that particular order to the computer is indicative of what he knew of the vessel's velocity capabilities. Personally, I find this to be fair evidence for warp eight as an attainable velocity for runabouts. It is not absolute proof, but like the Kira search I don't think it is disproof, either. Of course, we do know from Voyager's "Resolutions" that the Type-9 shuttle (believed to be the speedboat shuttlecraft) has a top speed of warp four, though it is suggested as top speed in the context of a multi-year voyage and thus may represent top cruising speed. One could argue that this should limit the Danube, but again I must point to the voluminous warp mechanics of the Danube versus any of the common shuttles, which are boxes with nacelles . . . where are the reactors? Well hidden and compact! So, the maximum speed of the Danube Class is unknown, but probably respectably high. She's more a truck than a speedboat, I'd imagine, but I doubt she's a slow truck. 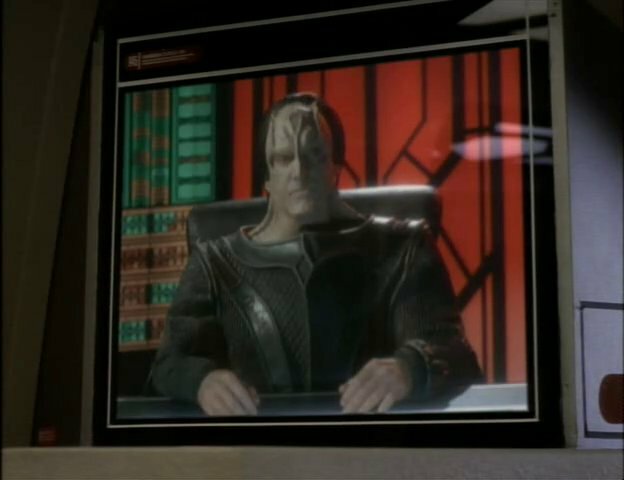 The following was removed on the grounds that popularly available data on the Cardassian ship mentioned is not supported by the canon evidence. See the next post about the Hideki class. In "Profit and Loss"[DSN2], we have a Cardassian shuttle (a runabout-sized first use of the model that would later be used for the Hideki, then finally as a shuttle again in "Tacking Into the Wind[DSN7]") that is suggested to be capable of warp eight by Quark. Do you really think Cardie ships of that size range are likely to be faster than Federation ones? I've decided to temporarily reactivate the blog at Blogger after their FTP-kill simply because, although I tweet at @STvSW and although I post at forums like StarfleetJedi.Net, I just prefer having the ability to make longer posts that are less ephemeral than tweets, and forum posts just get lost in the clutter. It also helped to jog my interest when some nutter posted an annoying comment on an ancient post which would never have shown up after the FTP thing. Now that the conversion has occurred, it appears now on the old Avenger and Devastator post. It is still my intent to recreate the website using Drupal or similar, just to make my life easier. Though I will note that I am also working on NoLettersHome.info since I think I finally found a way to accomplish what I've wanted to accomplish for a long while with that. I'm actually kind of interested in doing a Trek version of it as well, though I would need to make that a community project like Memory Alpha. Specifically, what I envisioned was having what one might call a "smarter wiki", wherein I could do a write-up of tech giblets from an episode and the various pieces of text -- say, about a hammer -- could link automatically to a page entitled "hammer" which includes the text from that episode's write-up as well as the paragraphs from any other page where I mention hammers. In other words, a truly dynamic site where if I had written text about Separatist warships I could easily look at every reference to them. The only real limitation on me would be making sure I compose paragraphs in such a way as to fit the multiple needs (e.g. no "regarding the last paragraph" sort of references). This would be distinct from a Wookieepedia type site in two ways. First, it wouldn't include all the Licensing-canon mess and would instead be solely Lucas-canon. Second, it would be less labor-intensive, since although Wookieepedia undoubtedly has a page on hammers, it requires manual action to add a new note on the page. And third, of course, it would be tech-focused. I am currently testing out two possible techniques and will make a note here if and when I get a move on. In the meantime, ST-v-SW.Net will be a little bit on the backburner, but I do eventually intend to revamp it. I'll keep you updated.